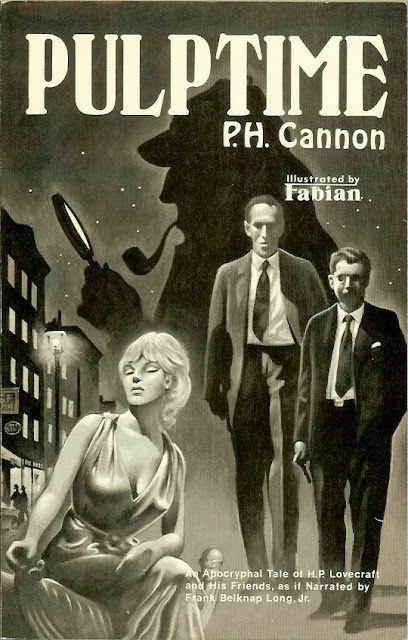 Pulptime by P.H. Cannon has Holmes teaming up with H.P. Lovecraft and Harry Houdini to solve a mystery in 1925 New York. Includes illustrations by Steve Fabian. In these pages, H.P. lovecraft lives again and Sherlock Holmes stalks New York of 1925, looking for a set of mysterious documents stolen by New York gangster Jan Martens. A visit with Harry Houdini, a seance with a beautiful medium, a trek through the New York sewer system––and what lay beyond––make a fascinating tale, as told through the words of young Weird Tales writer Frank Belknap Long, Jr., Lovecraft's best friend. As for what the documents are, and whether there were recovered––read on!